After you’ve hung up, you can take a moment to pat yourself on the back, but just for a moment. This is where the hard work actually begins. If you want to nail your job interview, then you must be prepared. While grade point averages and extracurriculars have their place, they are not what will get you hired by the sports industry. Your skills are. If you can’t provide an answer, you might as well cancel the interview. While this sounds harsh, it is the truth. The sports industry is a results oriented one, and prospective employers want to ensure that your talent can be converted into results. Know what your skills are and what you have to bring to the table. Put yourself on the other side of the interviewer’s desk. If you were interviewing a candidate for a position, wouldn’t you want to ensure that they can deliver? When you can put yourself in the mindset of a hiring manager, you’ll discover that the interview processor will become much simpler. The sports quiz is usually only administered during entry level jobs, but most individuals who enter sports management will begin by working in an entry level position and working their way up the proverbial ladder. You don’t have to know the personal stats for every Heisman Trophy winner for the last ten years, but you do need to know what you are talking about. Know how to calculate basic information, like earned run average (ERA) or wins above replacement (WAR). If you are interviewing to work with a specific organization or team, ensure that you know their history backwards and forwards (e.g. awards on, most successful managers/coaches, etc.). There is importance in the details. Having a working knowledge of other sports besides hockey, baseball, basketball, and football. While most jobs will be associated with the “big 4”, there are also a plethora of positions available with lesser known organizations like golf, tennis, or Olympic events. You don’t have to answer every question correctly on a sports quiz in order to be hired, so don’t worry too much. Try not to overthink it. In the hiring process, the sports quiz should be thought of as simply another data point. Expect the sports quiz to be conducted early on in the interview process. It is a means to weed out poor candidates, not to qualify potential hires. An interviewer will make assumptions and judgements about you based upon your body language. Be mindful of this. Maintain even eye contact throughout your interview. Keep your hands planted in your lap. Don’t fidget and don’t go overboard with the hand gestures. serves as an indicator that you are “working” the interview. Don’t be afraid to smile. 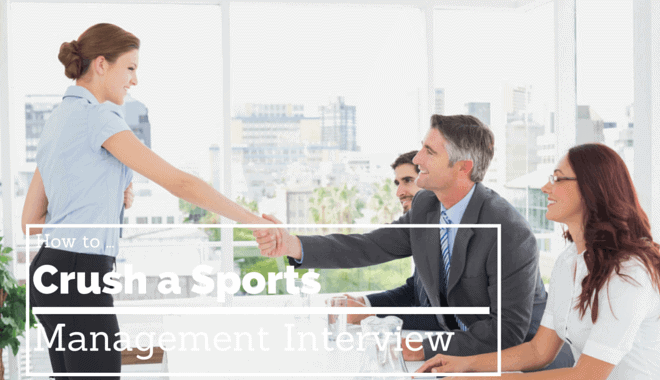 With all of these tips in mind, you will be able to create a positive first impression on your interviewer and will conquer the first step in obtaining your dream career in sports management.